Automatic garage door systems have become quite prevalent, and many homeowners choose to get such a mechanism because of the many benefit it offers. As technology advances, so do the different additions that these systems can integrate. New smart technology has made using a door easier than sending a text message. The main reason most people opt for an automated system relates directly to convenience. Manual door systems can be an absolute hassle to operate, especially if you have to use them on a daily basis, and the task can become somewhat annoying after a while. An automated door will make things a lot easier, and simplify the action down to the push of a button. It will also save you time and will do away with the trouble of having to get out of your car while it's pouring rain out to open and close the door. Another chief concern for garage door owners is protection. You want to make sure that your stored belongings are kept safe, and that your garage can't be exploited to gain entrance to the rest of your home. You can have a wireless keypad installed which will allow only people with the password to operate the door, or you can get an opener that offers smartphone connectivity, which will allow you to use the door from practically anywhere. As for personal safety, automatic systems are required to have special features installed that prevent them from hurting people or objects that get in their way. These are usually the photo eye sensors, which are installed on the bottom parts of the vertical tracks, and the force-resistance auto-reverse mechanism. These features need to be tested every so often to ensure they're functioning correctly, but other than that, they don't require any other maintenance efforts. 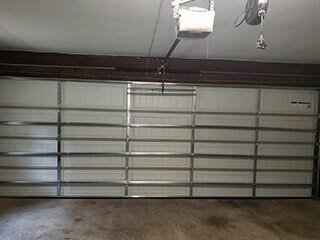 An often overlooked value of an automatic garage door is the effect it has on the value of your property. While the condition of the panels themselves will affect the curb appeal of your home, the type of opener you have and its age will also add a certain amount of monetary value. So while you may end up spending a little extra on maintenance and installation, in the long run, an automatic door system will be more than worth the investment. If you're thinking about getting a new automatic opener, contact our team at Garage Door Repair Greenwich and our experts will be happy to answer any question you may have. It's important that you find the right system for your needs so that you'll be able to enjoy a smooth and convenient operation for a long time.